In a speech to engineers about taking pride in our profession, I mentioned two lists of engineering achievements put together by the National Academy of Engineering. The older list ranks the 20 greatest engineering achievements of the last century. 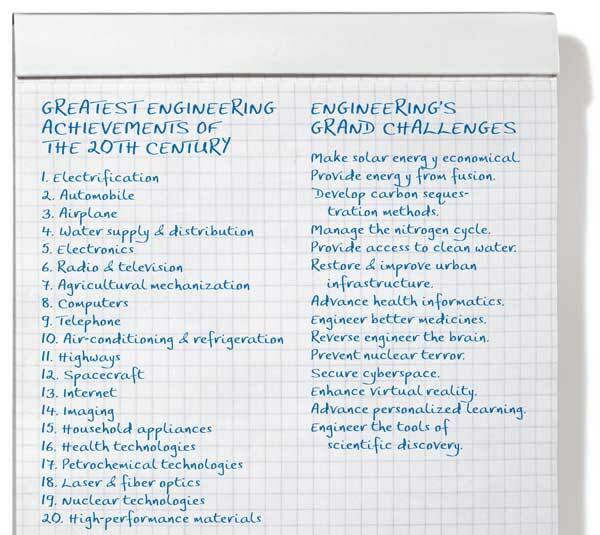 The newer list consists of 14 grand challenges to be accomplished by engineers in the present century. As I walked out of the banquet hall, someone muttered, "I liked the old list better." That offhand comment started me thinking. I remember helping to put that list together. The achievements chosen and their rankings were based on the relative importance of their benefits to society. Electrical engineering figured prominently: fiber optics and lasers, household appliances, imaging, the Internet, telephones, computers, radio and television, electronics, and of course electrification itself. The new list has such challenges as securing cyberspace, preventing nuclear terror, advancing health informatics, making solar energy economical, reverse engineering the brain, and enhancing virtual reality. What strikes me now about the old list is that, although each achievement resulted in sweeping societal changes, it began with an invention in the classic sense, made by a small number of inventors that focused on solving a relatively narrow problem. Moreover, the invention itself was a discrete thing, as opposed to a large system or collection of ideas. For example, the transistor was developed in order to implement better telephone repeater circuits. The Internet was originally intended to transfer files between mainframe computers, and it was thought that the computer itself would have only a small market consisting of large organizations with special needs. Similar things could be said about most of the other achievements on the list. The automobile wasn't designed to populate the suburbs, air-conditioning wasn't invented to increase the size of cities in hot climates, and household appliances weren't developed to enable more women to join the workforce. This is the way it has always been. Small, discrete, thinglike inventions—the printing press, the steam engine, the cotton gin, the electric light, and so forth—change society in ways that go far past the plans and expectations of the inventor. In contrast, the new list turns the paradigm upside down. An important social benefit is postulated, and engineers are challenged to make an invention, or more likely a system, that accomplishes the designated social upheaval. This is not to say that the upside-down approach cannot be effective. I would hope that the new generation of engineers will be motivated by opportunities to improve the world, and I do believe that most of these challenges will ultimately be met. However, I also think that the challenges will be met by cross-disciplinary teams of relatively unknown people developing large systems, policies, and procedures. When the history of this century is written, I wonder what a list of great engineering achievements will look like—and will we associate specific inventors with them? Is the era of brilliant, discrete inventions by individuals coming to an end in favor of systemic, planned social engineering by large teams? I regret that few if any of us now will ever know.